Red Ginger (Alpinia purpurata) is an ornamental perennial, flowering houseplant which grows upright up to 4 meters tall, and has leafy, cane-like stems. The aromatic rhizomes, grow and spread in thick clusters, produce aerial shoots when older shoots dried up. It produces attractive showy small white flowers on brightly colored red bracts. It thrives best in bright locations with some direct sun. Red ginger makes a stunning floor plant in front of a sunny window. Turn the pot each week to give each side equal light exposure. It prefers in well-drained, good-quality potting mix. Water regularly throughout the growing season, keeping the soil evenly moist. After flowering is finished, water sparingly. Yellow leaves are usually a sign of overwatering. It prefers an average room temperature of 60°F-75°F / 16°C-24°C. If you scoot your container to the patio or porch for the summer, don’t worry, it can take the heat. But bring it back indoors when the temperature drops. These tender perennials will only tolerate temperatures as low as 50°F/10°C. Fertilize monthly in spring and summer with a high-potassium liquid fertilizer diluted by half. It can be easily propagated by offsets or divide the rhizomes in spring for summer bloom. 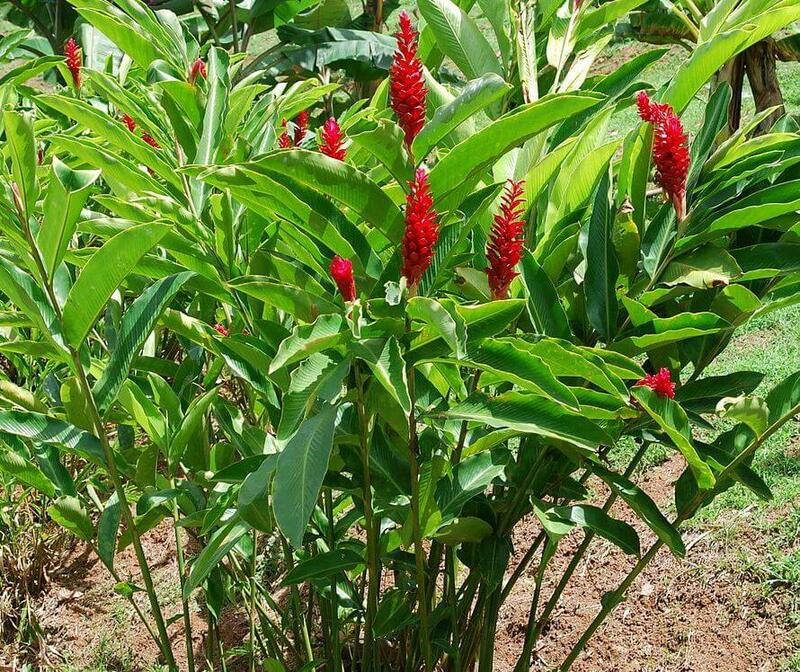 Red ginger can be plagued by aphids, mealybugs, earwigs, thrips, scale, fungus, root rot, and nematodes. But this plant is generally healthy and easy to care for.